Alberti's Window: What if Sculptures Were Painted? What if Sculptures Were Painted? This week I have been reading Colin Cunningham's essay "The Parthenon Marbles" (a preview of which is available here). Cunningham spends much of this essay examining how the bringing of the Parthenon marbles (by Lord Elgin) to the British Museum has affected the Western canon of art. (When using the word "canon" I am referring to the artistic standard and aesthetic value that has been determined by Western culture over centuries.) The bringing of original Greek statues to England was huge, especially in the 19th century, since many artists had only known Greek art through Roman copies. After the marbles were brought to the British Museum in 1816, thousands of artists began to study these works for their aesthetic properties. I was most intrigued by Cunningham's discussion of how classical sculpture continues to be left unpainted. We know that Greek and Roman sculpture used to be painted, and many sculptures have left behind traces of paint (including sculptures on the Parthenon). 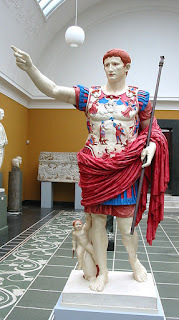 Modern techniques have enabled exhibitions (such as this one and this one) to show reconstructions of how these sculptures appeared originally, such as this example of Augustus of Primaporta (right, original dated ca. 20 BC). So, what do you think of painted sculpture? Does it weird you out? Cunningham points out, "If the idea of coloured sculpture seems strange to you, that shows the influence the western canon has had on all of us. "2 Personally, I like looking at painted reconstructions of ancient sculpture, because it reminds me how much the Western canon and my own artistic preferences have been constructed. I'm sure that ancient Greeks and Romans would think it bizarre that later cultures left their sculptures white and unadorned. And the funny thing is, we've continued to create unadored, unpainted sculptures for centuries, all in the name of classicism! What if classical sculpture had still been painted when it was discovered? That could have changed the face of the Western art - quite literally, in fact, if you think about painted faces! 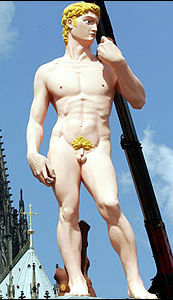 Consider if Michelangelo's David had been painted. You can get an idea of what it might have looked like from this sculpture created after Michelangelo's David (left, by a German artist, displayed in Cologne as part of the Museum Ludwig collection). Or what if Bernini's sculptures had been painted? 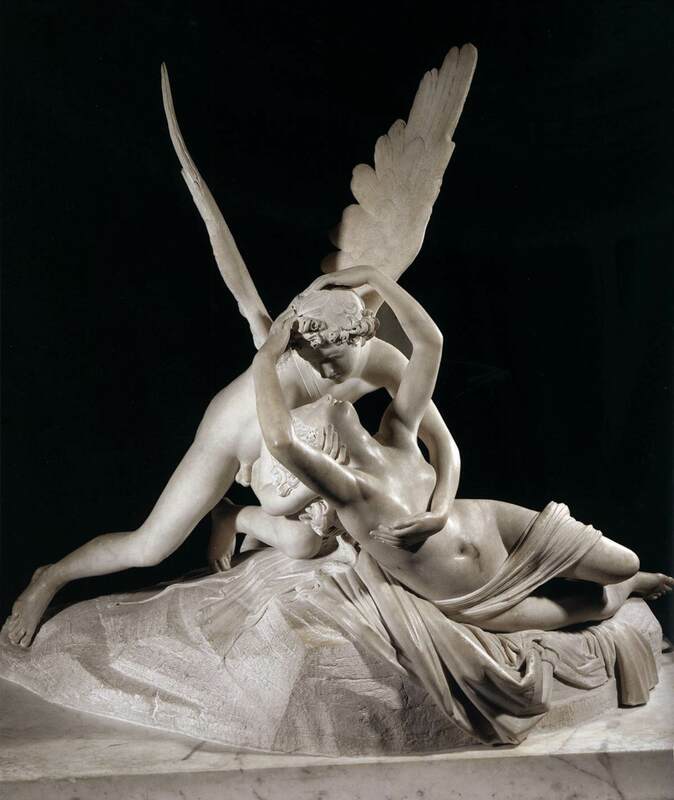 Or neoclassical sculptures, like Canova's Cupid and Psyche? Art and art history could have been totally different than how they have turned out. How do you feel about that? 1 John Hooper, "The Ancients: Now Available in Color," in The Guardian, 22 November 2004. Available online here. 2 Colin Cunninghman, "The Parthenon Marbles," in Academies, Museums and Canons of Art, Gill Perry and Colin Cunningham, eds. (New Haven: Yale University Press, 1999), 70.